If you want noise canceling headphones, Sony's WH-1000X M2 is the king of 2017. If you want active noise canceling headphones, and you're not willing to sacrifice... anything: this is the set for you. Cheaper than the Bose QC35 IIs, the Sony WH-1000X M2 not only performs better, but gives you far more listening options than any of its competitors. A sequel to the rock-solid Sony MDR-1000X, these headphones are every bit as worthy of your attention as anything else on the market. 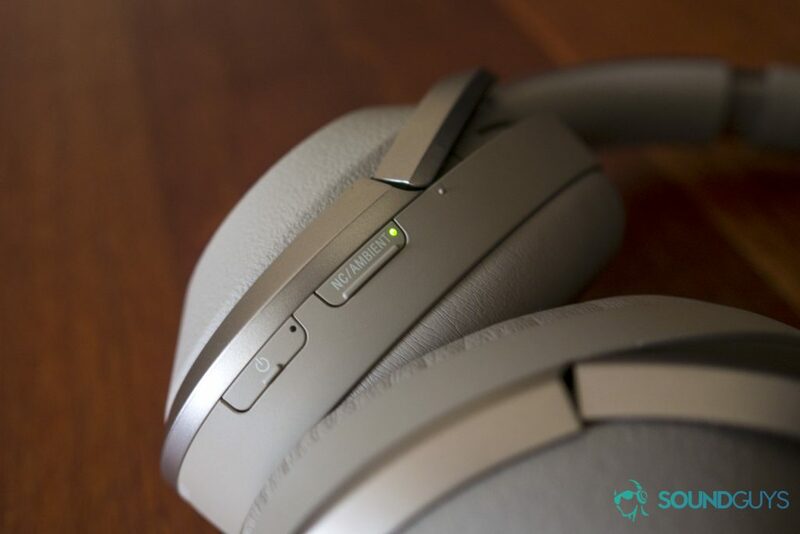 For the last year, the Sony WH-1000XM2 have been our best set of noise canceling headphones. That’s no surprise: they’re fantastic. However, with the new Sony WH-1000XM3 on the market, where does the aging WH-1000XM2 belong? In your hands, if you find them on sale! Editor’s note: this review was updated on January 8th, 2019 to reflect an update that makes these compatible with Amazon’s voice assistant Alexa. Sliding the black tray out of the paper casing, you’ll open the box to see a carrying case containing all the goodies inside. Unzip the case and you’ll see your headphones, and an airplane adapter. Underneath the case is a microUSB cable, 3.5mm male-to-male cable for wired listening, and assorted documentation. This is a seriously well-designed set of cans, if you want my professional opinion. Sony’s been in the audio game for a long time, and it shows. Despite the WH-1000XM2 sporting a plastic exterior, these headphones feel worth every bit of the asking price, especially when there’s a lot more features that meet the eye. For example, there’s a pretty clever way of controlling playback on the right ear cup with a touch interface. The outside of the headphones is largely semi-reflective plastic, with a textured backing to the ear cups that give it the appearance of a leather-like material. Even if you prefer the black model to the champagne-colored one, both variants of the WH-1000XM2 look competent and mature. Really the only thing blemishing the exterior is an NFC logo on the left ear cup, though it’s not unexpected at this point. A carrying case makes for easy travel, as the WH-1000XM2 folds up flat. If you’re worried about long-term comfort, I was able to listen for a few hours with no real issues to speak of, though like most closed-back cans, the WH-1000MX2 can build up heat pretty quickly if you’re walking around a lot. However, the super-soft leatherette earpads do a great job of cradling your pinna without putting too much pressure on your head—assuming you fit the adjustable band correctly. If you don’t, you’ll definitely notice the cans sliding around with movement. 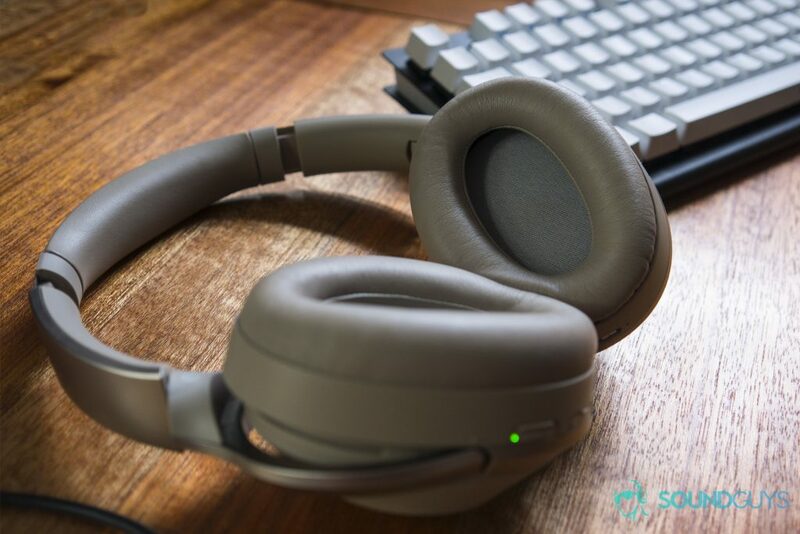 In conjunction with angled drivers, these headphones fit much better than they may appear at first glance, as they make the most of their space. In the dead center of the large-diaphragm drivers are smaller ANC drivers that take aim right at where your ear canal would most likely be, allowing for a much closer output of destructive interference to cancel out noise. It’s not necessarily a new design, but it’s a cool one nonetheless. Soft ear pads and deceptively deep ear cups make for a comfortable listening experience. It’s a little perplexing why these headphones don’t use USB-C to charge in a world that’s largely moved beyond microUSB, but that’s really not much of an issue. For better or worse, the charging port is on the right ear cup, while the 3.5mm jack is on the left. While that does mean listening to your cans while charging will be a pain, the upside is that you never have to worry about wiring issues or other common build problems frying one jack or the other. Though you can use the included 3.5mm TRRS wired plug, many will elect to use the wireless Bluetooth features of this set of cans. I’m still not a fan, but if there’s a set of headphones out there that can make the most of the tech, it’s the WH-1000X M2. I say this, because the control interface is super good, and you need to be listening wirelessly in order to make full use of it. There are the basic functions, like swipe forward and backward to skip tracks, swiping up and down to adjust volume, and tapping to play/pause your music. But there are a couple advanced features too, like starting a passthrough function so you can hear the world around you if you put your hand over the right ear cup. If you long-press you finger into the right ear cup’s backing, your default voice assistant will be activated—whether that’s Siri, Bixby, or the one true Google Assisstant. This puts the Sony WH-1000X M2’s functionality at or just beyond its main competitor, the Bose QC35 II. Plus, a new update is going to be rolling out via the Sony Connect app that will also make these compatible with Amazon’s Alexa as well so you have options. However, this Sony is head and shoulders above its more-expensive antagonist when it comes to wireless tech. A long press on the right ear cup calls your favorite voice assistant up on your smartphone—Apple or Android. Not only does the WH-1000XM2 support Sony’s LDAC hi-res audio codec (works only with Sony, Android 8+ sources), but it also supports the prized aptX, aptX HD, and AAC codecs that are the best of Bluetooth for Android and Apple, respectively. If you own a phone without aptX or AAC support, you’re going to wind up with crappier audio in the SBC codec. Though most newer phones can push the bitrate above 200kbps, you might notice a quiet hiss in the background or your tunes sounding a bit muffled. That’s normal, and not a flaw of the headphones themselves: it’s a problem inherent to crappier Bluetooth standards. The WH-1000XM2 isn’t unique in its use of a dedicated app, but it’s really cool in what it can do with Sony’s Headphones Connect app. For example, you can change the ANC modes to adapt to changing environments and air pressure, as well as change how your music sounds with all sorts of fun signal processing. You can also simulate concert environments, equalize your music, and give yourself the illusion of speakers in 3D space. While I wound up just using the standard EQ settings and leaving the signal processors off, I did find the ANC optimizer, Ambient sound control, and the quality preference to be very helpful. Not to mention the promise of future updates with added functionality like the Alexa compatibility we mentioned earlier. Your results may vary, but the app doesn’t bombard you with adds, so it’s definitely worth a download. How well does it cancel noise? Damned well. Though, I should point out that a lot of how the WH-1000XM2 keeps garbage sound out has to do with the fact that they isolate pretty well anyway. That’s not a bad thing though: isolating a lot of noise keeps incidental sounds at bay too, and it’s preferable to ANC alone. Before using this feature, you may want to play around the app a bit, because it allows you to calibrate the WH-1000XM2 to your head. It plays a couple test tones, measures the response, and adjusts accordingly. 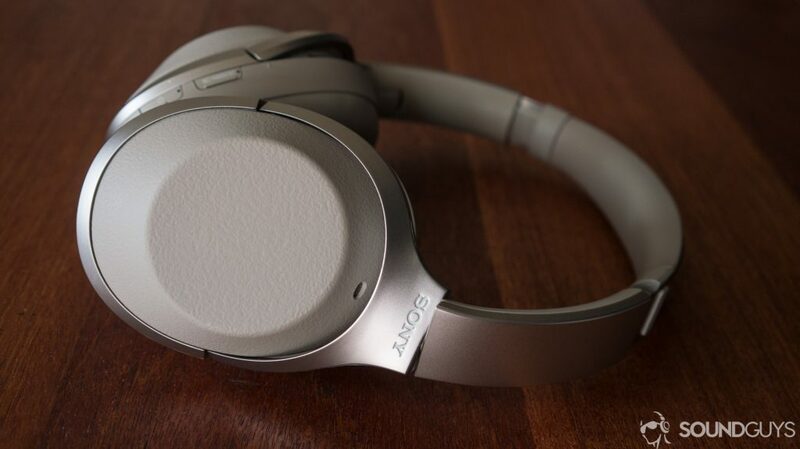 The active noise cancellation is easy to toggle with a simple press of a button. Though my informal tests really didn’t highlight any issues outside of a strange ultra-quiet white noise in the background of everything, I wasn’t able to take these on an airplane in the short time I had the WH-1000XM2. Oh well, Boston’s T is noisy enough—often reaching 85dB on the red line. Let’s see what our not-quite-scientific test head had to say about these. Where the WH-1000XM2 stands alone is its ability to block out low-end noise. That’s the most important range to attenuate. Well, that explains it! These block out a decent amount of low-end noise and mids, which is the best possible range to block out. That means that most of the basic sounds that make up music won’t be interfered with all that much, and even if you weren’t listening to music, they’d be reduced in power by over 75% in volume, 95-99% in power. That’s fantastic for a set of ANC headphones, and these weren’t even in ideal test conditions. This is actually where most ANC headphones not made by AKG or Bose tend to trip up, as the low end is a lot harder to cancel out given how much longer each wavelength in that range is. So to have a set of headphones that can cancel out sub-200Hz sound as well as the Sony WH-1000XM2 can is truly special. If you need to hear someone speak for a moment, put your whole hand over the right earcup to toggle the passthrough function. Of course, this may not always be the safest thing in the world, so if you need to hear what’s going on around you, the app also lets you control how much you hear. While I’m an extreme critic of all things Bluetooth, these headphones are among the best implementations I’ve heard with the sub-optimal wireless tech (I’m not bitter about the headphone jack dying off I swear). Truth be told Sony is the company that’s put a small fortune into R&D to be the brand people look to when you want quality wireless, and standards like its LDAC sit at the top of the wireless heap. Right out of the box, the headphones are tuned to emphasize bass over mids, but the sound is quite clear—unusual for this kind of emphasis. However, this isn’t for everyone, and you may want to explore using the app’s equalization if you’re looking for a more tailored experience. There are lots of options there, so I’m only going over the stock default today. But I didn’t run into any distortion, or channel balance issues that were too egregious… or at least couldn’t be explained by bad mixing, anyway. The default sound profile does seem to emphasize bass a little too much, but if you’re listening wirelessly, you can easily just tweak that in the app. If you’re using a wired connection, however, you’re outta luck. It’s most obvious in post-1990 “loudness war” era songs, so if you’re listening to Meatloaf like I’m doing right now, nothing will sound amiss. If you’re listening to bassy music with low vocals, however, the vocals from Alice in Chains gets drowned out by the kick drum, bass, and drop-D guitar. The same is true with Run the Jewels’ Lie, Cheat, Steal. I recommend dropping the “clear bass” down by at least three, preferably five notches, while simultaneously boosting the 400Hz, 1kHz sliders up a couple if you’re prone to listen to more classical or electronic music. While Beats has sorta popularized the whole “drown everyone in bass” sound signature—it doesn’t really do the WH-1000XM2 any favors. Considering I listen to music for at least 8 hours a day, I’m very unlikely to listen to the same genre over a long period of time. If you want to avoid rattling your skull and missing out on Andrea Bocelli’s voice in Con Te Partiro, you’re gonna wanna try to rein in that bass. Of course, there’s a tradeoff here. Unfortunately, the only way to equalize your tunes is if you tell the headphones to default to SBC over the app. Though you’ll probably not notice anything amiss when you’re on the go, the fact of the matter is you’re going to be listening with a lower bitrate and audio quality. As it sits without an update to the app: you can only use aptX HD, LDAC, and AAC with the default overly-bassy sound profile. If you’re like me and prefer wired listening, you can still do that with the Sony WH-1000XM2. Noise canceling headphones are really good at getting rid of droning sounds like computer fans, and engines. In Champagne or Black, the feature-sparse WH-1000XM2 is a looker. Frankly, these are still excellent headphones that aren’t really a downgrade from the newer WH-1000XM3 unless you only have USB-C chargers. While having a healthy bass bump can be a good thing, the current trends toward overemphasis are perplexing and… wrong. Sony did a fantastic thing in allowing consumers to customize their own sound, and sidestepping the issue entirely. The WH-1000XM2 sound fantastic, even when you mess around with the EQ settings. But that active noise cancelling… that’s truly special. I’ll have to get my hands on more units to be sure, but the adaptive ANC features are killer, and block out a very impressive amount of low-end noise. Obviously, $350 is a lot of money to spend on headphones, and if you need to find a bargain online you can probably nab the almost-as-good MDR-1000X for a healthy discount. They’re almost as good, if I’m being completely honest—though you are losing a tiny bit of ANC performance, and impressive app functionality. There’s also the option of the Bose QC35 II, but you’re going to want the better sound quality of the Sony. It’s just that good.